Did you know that you can purchase these knobs at your local home improvement stores. They cost just a fraction of the vintage ones. 6.00 for two knobs aint' bad. 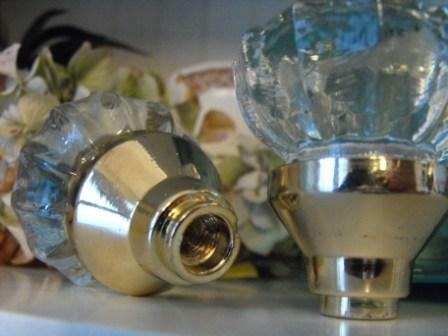 I bought these at Lowes and they come in that pretty brass everyone is gaga over..hehe! If you look at the knob on the left picture above you will see a tiny hole where a small screw goes. I wanted to show you the before and after in one shot. You can paint that pretty brass to make it tone down a bit. Now it looks like this! This is the same project that I showed y'all yesterday but with a twist. Instead of fun vintage colors I did a solid black and sanded and stained. Still the old worn look going on but with a simple color change and different knobs you get a completely different look. Are y'all getting tired of this old hat? I am! Both of these coat racks are for sale but they are a bit heavy and I'm not sure on shipping. If you are interested just let me know and I can check on the shipping price for you. Just look at em'...all cute and brassy. Have any great ideas using these knobs and want to share? We would love to hear about them! Ooh, this one's pretty too! Very clever. Susie this is BEAUTIFUL!!! You are so clever. I was wondering if you could explain a little more how the knob attaches to the wood. You might could also use Sophisticated Fininishes to cover the brass. Thanks for sharing with us! Very pretty. Our previous house was an old one, built in the 20's. 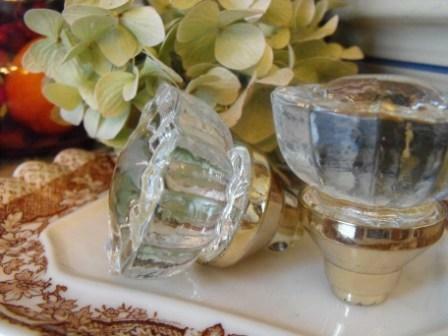 And every door knob was those beautiful glass ones. I wish now that when we left I had my hubby remove everyone and replace them with the ugly knobs. Oh well! Live and learn. Love the shelf, great idea! Good morning sister susie...Love those knobs. Will give ya a ringgie dinggie later this a.m.
Susie.. you rat dog.. heehee.. you gave away our wee lil' secret. I love the knobs both from Home Depot and Lowes. 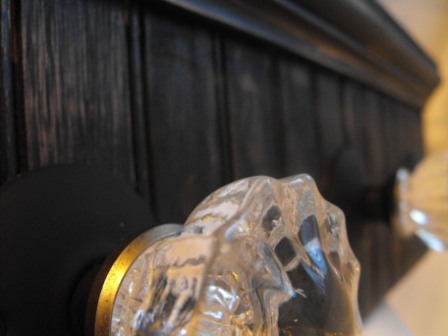 Okay, I am LOVING this in black with the glass knobs. 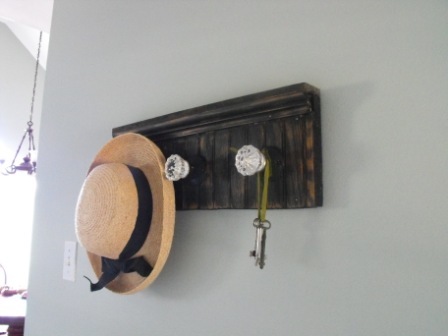 Love this coat rack even better. Those cute knobs look great just lying around. My daughter has an old iron bed and it was missing the knobs on the headboard and footboard. We looked everywhere for some old one's and decided we were not going to pay what most were asking for so I bought the new one's just like yours. Didn't like the brass so we dipped them in MOD PODGE and rolled them in beads (seed beads in pastel colors) and they turned out GREAT!! They screwed right on the headboard and footboard and look wonderful!!! Very very pretty...but why did you change the brass? ha ha ha! It looks mahvelous! Love it!! I love both coat and hat racks you made, but this one is my fave. 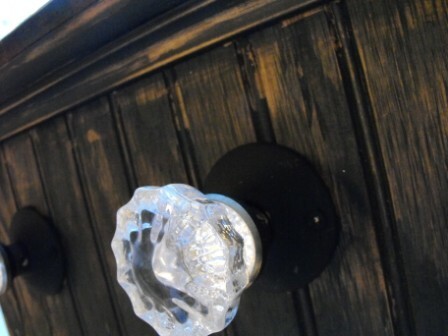 I am partial to glass or porcelain knobs and they just pop off the black. 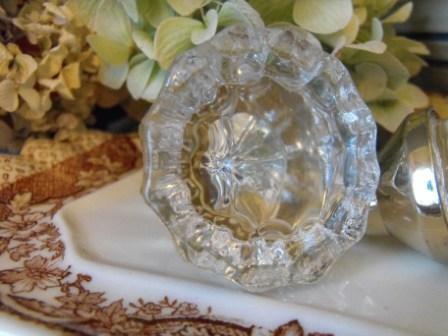 I have seen folks use smaller glass or porcelain knobs above a window and hang curtains off of them. How is the cottage coming? That looks beautiful! LOVE those knobs! 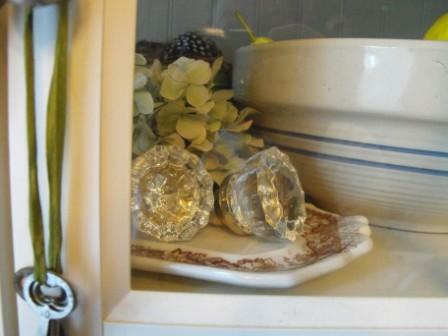 I think this rack is my fav too--just because of the glass knobs! Love what you did with the brass! 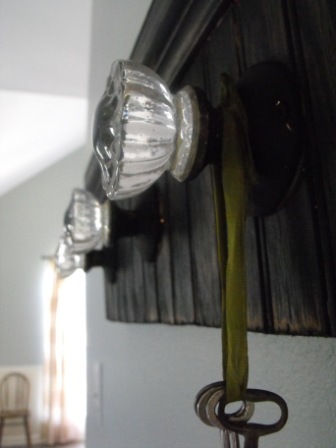 I did the same with "1980 vintage" brass light fixtures in the bathroom! They look so much better! Love it, of course. Would love it in white, too. You're probably doing that one right now as I type this! You are like an energizer bunny! Ha Ha! I love it! That's why I posted about you. You are amazing! I love those knobs, very cute! Ooh love the black one!! Just thought I would share with you that my friend LOVED her initial plaque. Thanks again for getting it out so quickly. They really are pretty knobs...what a great project too! Happy Thursday to you Susie!!! I love the whole thing! including the hat!!! 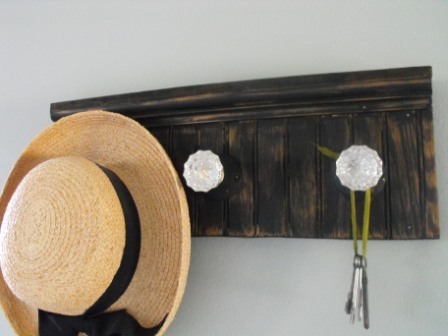 Another cute coat rack project!! It is amazing how a color and knob change completely transforms the look of the coatrack. Love them all but this one is my favorite (so far). 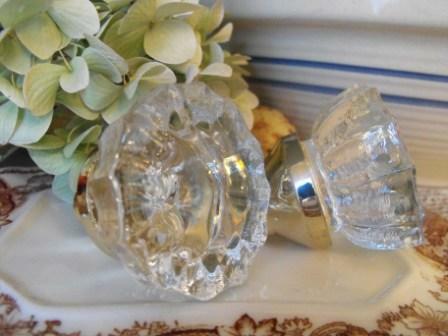 I have always dearly loved clear glass knobs. Evokes memories of my childhood. Oh just beautiful Susie, love the glass knobs and what fun on a coat rack. Really Susie, another one. Jeez, take a break already. Truely they are gorgeous and you are so very talented. I have an idea...and I have some not so new knobs that'll be perfect....You've inspired me. Ooh, I love the glass doorknobs. :) I was very lucky to have my neighbour gift me with a box of vintage ones. I love the project - I think I'll try it out with the left over knobs. Hi Dear Susieness! Oh, these knobs are wonderful! I love how they look on your pretty hanger. I'm so glad to see you're back to your little ole creative self! Yay!! I have been on the hunt for vintage ones to make curtain tie backs and have been unsuccessful! I called my local Lowes and they have em!! Fun weekend project! Love the knobs! I'm really writing to thank you for the plaque I ordered and received recently. I ordered the one with the birdnest on the front and the writing in the background. It's beautiful! Thanks again! Oooh, I've been looking for a knob like that! Find vintage ones all the time, but those won't work for what I need. I love it with the glass knobs. It's gorgeous.